I am pleased to announce on behalf of the Friends of the Stewartstown Railroad, Inc., that we have received a generous donation from the York Railway Company. A crew was busy this past Saturday preparing a Tie Inserter and Ballast Regulator for pickup in 2 weeks. 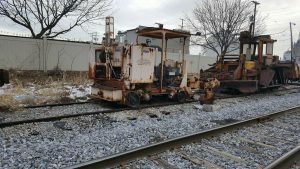 When these items come to the Stewartstown Railroad, they will be repaired, painted, and placed into service. 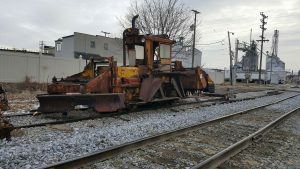 The Tie Inserter will be especially helpful this spring to our volunteer track crews as we expand the ride on the mainline. Productivity could jump to over 100 ties per day. The ballast regulator comes without a front axle, so it may be a while before it goes into service. The York Railway Company has also donated former MA and PA locomotive 84 to the Friends of the Stewartstown Railroad. It will be going into storage for evaluation and repairs before coming home at a later point in time. MA and PA 84 will remain in its current paint scheme as long as possible. 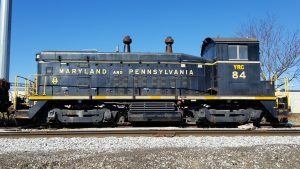 Donations toward MA and PA Locomotive 84’s restoration and repairs can be sent to: Friends of the Stewartstown Railroad, Inc. Po Box 456 Stewartstown, PA 17363. We sincerely thank the York Railway Company for the generous donation to the Friends of the Stewartstown Railroad. ‹ We received a grant!